The 12th Annual Truck & Equipment Show will take place rain or shine on August 17th, 2019. Gates open 8am to 4pm. Admission and registration are FREE to this community event. All food sales and donations benefit local area churches, the New Alexandria Volunteer Fire Dept. and the New Alex Lion's Club! 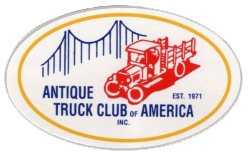 All makes, models and years of trucks are welcome along with classic cars, pick-ups, farm tractors, race cars and equipment of all kinds! Pre-registration is not required but we would like you to fill out the short form below so we have an idea of how many dash plaques to order. When you arrive at the show on the 17th, please stop at the registration booth at the front gate for the official show registration. Bring the whole family out for a day of fun! There will be plenty to see and do including games, prizes, flea market booths and live DJ music by Phoenix Music Group from 10am-3pm! Guaranteed to be something fun for everyone! Dash plaques and door prizes for drivers!